Editor’s Note: Adobe has announced Creative Suite 3, a massive overhaul to its applications for creative pros. Before the software bundle ships in April, we’re taking a closer look at some of the applications that make up Creative Suite 3. This installment previews Fireworks CS3. When Adobe bought Macromedia for $3.4 billion in 2005, Fireworks users fretted that the merger meant the end was near for their favorite Web graphics program. After all, Adobe’s ImageReady was Fireworks main rival—surely, the company would favor its own in-house offering over a newly acquired program. Those rumors were soon put to rest when Adobe invited users to participate in beta-testing a Fireworks upgrade. According to Danielle Beaumont, Senior Product Manager for Fireworks, ImageReady will be phased out and will not be included in the future CS3 product line. Instead, the newly announced Creative Suite 3 features Fireworks CS3. Adobe says the driving concept behind Fireworks CS3 is improving workflow from concept to finished product. Fireworks’ new Pages panel tackles just that. Using the Pages panel, designers can create various mock-ups of a Web site containing working hyperlinks in a single Fireworks file. The Pages panel allows designers to set a master page containing elements they want to appear on every page. While the master page is a nice addition, I found the ability to share layers among different pages the most useful and exciting innovation. By selecting a layer in the Layers panel and choosing “Share layer to pages,” designers can select the pages on which they want a layer’s elements to appear. 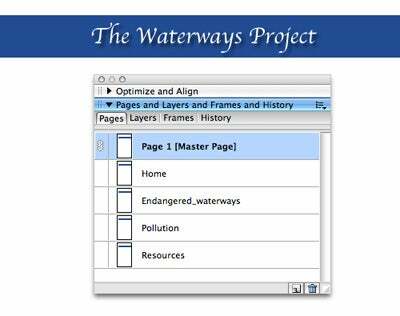 The initial layout for the Waterways Web site was created using Fireworks’ new Pages panel. Another new feature added with Fireworks CS3 is the Common Library containing a collection of common Web page elements. The library contains objects with editable attributes such as buttons and arrows. This means designers can place a symbol on the canvas and, using the new Symbol Properties panel, change its text, color, and other attributes without modifying the actual symbol. Designers can also create and add their own Rich Symbols to the Common Library. The Common Library is a universal library, meaning any symbol you add will be available to all Fireworks files. The inclusion of intelligent scaling using 9-slice scaling allows designers to define the parts of a bitmap or vector symbol to scale and the parts to preserve. For example, when scaling a rectangle with rounded corners, the corners typically will become distorted. With 9-slice scaling, you can select to scale the sides of the rectangle and preserve the corners. The scaling is preserved even when copying and pasting a symbol to Flash CS3. Enhancements for creativity include a new Color Palette for blending custom colors and the addition of seven Photoshop blend modes: dissolve, linear burn, linear dodge, vivid light, linear light, pin light, and hard mix. The new Photoshop Live Effects dialog allows designers to add and edit Photoshop effects within Fireworks. In addition, Photoshop files containing layers and effects such as bevels and shadows maintain their edibility when imported or opened in Fireworks. However, in my prerelease version of the software, I encountered a bug with this feature both opening and importing Photoshop CS2 files. Instead of maintaining edibility, Fireworks brought the files in flattened or failed to open them. On the other hand, Fireworks did maintain the edibility of the Photoshop CS and CS3 files I tested. A final version Fireworks CS3 will ship with the rest of Adobe’s Creative Suite 3 Web offering when that collection arrives in April. Stay tuned to find out about additional enhancements, features, and performance in the final release. [ Cyndy Cashman is the founder of Breakaway Interactive, a software training, design, and consulting company.